Okay, technically, Impact is not a book I'm reviewing. 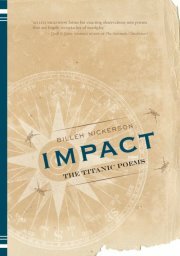 Impact and its author Billeh Nickerson are the subject of a profile I've written. Profiles tend to feature positive descriptions of the book and the author's publication history/interests; they're usually supplemented with interview material. Profiles are rarely hostile (or even critical), that's why they're sometimes disparaged as "puff pieces"—eg, "Author X is one of the greatest living novelists, and his latest work is one of the best books in recent memory. It is impossible to find enough superlatives to describe its breathtaking compassion and astonishing intelligence." I'm not saying mine is a puff piece, of course. Heaven forbid! Choosing to write about a topic that's been so widely discussed and so widely depicted it has become part of global consciousness is an act of artistic bravery. After all, there's a strong temptation to believe nothing fresh or new can be said about the trenches of WWI or Studio 54 (to name the first two well-worn topics that sprang to mind). And by focusing on the tried-and-true, any writer risks cliché and/or boring readers silly with repetition of what everyone already knows. Yet, authors still go for broke and manage to breathe fresh life into familiar material [writing while tired leads to hackneyed phrasing and godawful mixed metaphors]. Grant Buday's Dragonflies and Margaret Atwood The Penelopiad are enjoyable especially because they give readers insight into characters and settings that have been part of literature for thousands of years. Even Every Man For Himself, Beryl Bainbridge's characteristically and delightfully weird contribution to 'Titanic literature,' enables readers to revise what they imagine as the facts of the great disaster—thanks in no small part to James Cameron, his cast, and that song. Nickerson, then, is likewise commendable for writing a book of poems about the nautical disaster of all nautical disasters, one that was also the subject of the biggest box office earner of all time (well, until Avatar). "I purposefully stayed on the peripheries of the story and tried to concentrate on areas that weren’t as common knowledge. This included many Canadian angles. I was also surprised by how little I actually described the physical size of the ship. I wanted to let the readers bring in their own thoughts. It’s similar to when something awful happens off camera in a horror movie in that the imagination can often be more potent." He wrote understanding perfectly that the subject matter was dangerous for the reasons I mentioned. To my eyes, the poems (and their avoidance of both the story's legendary facets and rich girl/poor boy endless love) encourage us to reconsider how the tragedy has, er, impacted an astonishing assortment of people for more than a century. Attentive to ship builders in Belfast and latter-day visitors to a cemetery in Halifax, the poems quietly meditate on meanings, showing that the legend is really composed of myriad stories, feelings, and responses, each of which is as valid and significant as the next. * Any resemblance to a review here is purely accidental.